ALOHA & E KOMO MAI! Welcome Life More Abundantly Island Church in Wahiawa! 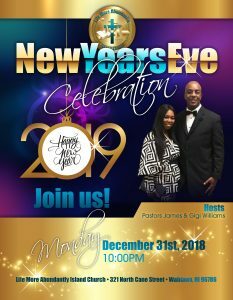 Join us for our New Year's Eve Celebration, Monday, Dec 31st at 10:00 pm. See our flyer below! 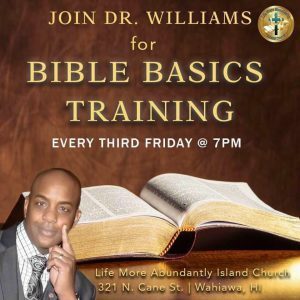 Life More Abundantly Island Church is a full-gospel, spirit-filled church in Wahiawa, Hawaii that preaches and teaches the true and living Word of God! We extend an invitation for you and your family to join us for an exciting worship service! You will be impacted by the message, the praise and worship, the Agape’ love and friendship. Come and see that LMAIC is the place to be! Don't forget to check the Calendar for upcoming events and services! Make your tithes & donations online or mail them in. Click here now! © 2019 Life More Abundantly Island Church. Created by Exodus Christian Web Design Studios. All rights reserved.